Died March 11, 2013 when the Navy jet she was piloting crashed in Eastern Washington State during a training mission. Also killed were Lt. Cmdr. Alan Patterson and LTJG William Mcllvaine. Valerie was the middle daughter of three and grew up in Ellicott City, Maryland. She was a 2009 graduate of the Naval Academy, where she had majored in aeronautical engineering and minored in French. Valerie excelled academically as well as athletically. She had lettered in soccer and lacrosse in high school and helped the women’s lacrosse team at the Naval Academy transition from a club sport to a competitive NCAA Division I team. Her love for lacrosse and her teammates resulted in deep friendships, and she inspired and mentored many of her teammates to pursue aviation with her same fearlessness and determination. Valerie met her husband, fellow USNA classmate and native Marylander, Sean Delaney, while training in Singapore and Australia after Plebe year. They were married on February 18, 2012 at the Naval Academy Chapel in Annapolis; and days after Valerie qualified her carrier landings. They made their home in Anacortes, WA, where they enjoyed mountain biking, snowboarding, and hunting together. Valerie was a person of great integrity, strong faith, and an unyielding compassion for all those she met. “Val was always up for a challenge and set extremely high goals for herself. She worked hard towards achieving her goal of becoming a Navy pilot,” said her mother, Doreen Cappelaere. 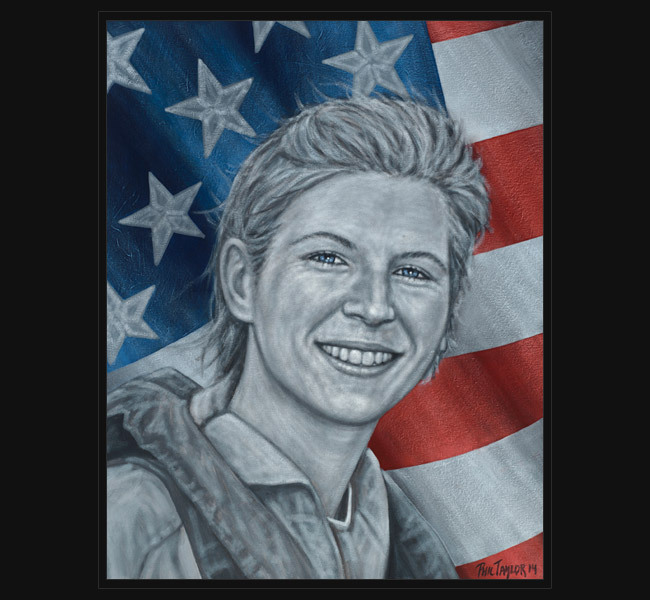 Original portrait was presented May 23, 2014 to her family during a special event hosted by the Women’s Memorial at Arlington Cemetery.